Private stroke lessons for children 6 years of age and older (4 and 5 year olds accepted depending on skill level; see below). 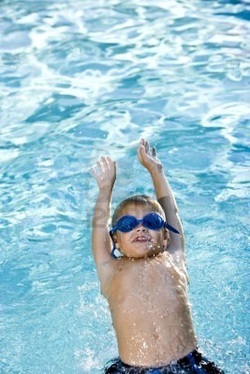 If your child is already a confident swimmer, they may be ready to learn specific strokes. Or maybe they already know some strokes and participate in swim team but need extra coaching to perfect their skills. Either way, private one-on-one lessons will help your child become a confident and competent swimmer. Four and five year olds will be evaluated to determine their skill level prior to being accepted for stroke lessons. They must first demonstrate mastery and confidence with the swim-float-swim survival sequence and be able to follow verbal instructions. This will be evaluated on an individual basis. For more information or to enroll your child, contact Anthea at survivalswimkids@hotmail.com or 518-577-7424. Schedule and Pricing: Stroke lessons will be offered throughout the year. Your child may participate in 10 or 20 minute lessons 3, 4, or 5 days a week, schedule permitting. The length of the lesson will depend on your child’s age and endurance level. This may seem shorter than your standard group swim lesson but remember that, in a 45 minute lesson with 5 students, each child receives less than 10 minutes of personal instruction. In addition, the private one-on-one format allows me to customize the lesson to your child's specific needs. It's never too late to learn to swim!! Private one-on-one lessons are offered for adults of all ages throughout the year at a rate of $25 per half hour lesson. Please contact Anthea at survivalswimkids@hotmail.com or 518-577-7424 for scheduling. Hi, I'm Anthea. Prior to becoming a survival swim teacher, I swam and dove competitively in high school and college. I have also been teaching Physical Education and Health at the elementary level since 2003. I have experience coaching boys and girls Varsity swimming and diving teams, teaching group and private stroke lessons, teaching Masters (Adult) swim lessons, and coaching springboard diving. I LOVE swimming and everything aquatics related and I thoroughly enjoy sharing that passion with others.